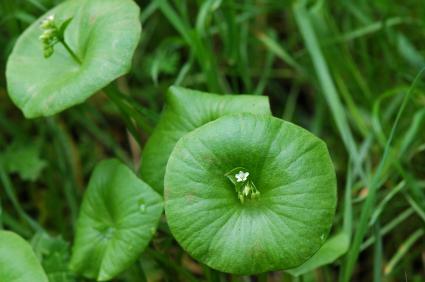 If you live in the Pacific Northwest and you're an avid hiker, knowing how to spot Miner's Lettuce could be valuable, life-saving knowledge if you ever got lost. This edible, native North American plant grows wild in many areas along the northern Pacific coast and has helped fill the bellies of both early settlers and Native Americans. This plant continues to be a wild delicacy today. Miner's lettuce is an annual, broadleaf plant that grows wild during the cooler winter months, throughout California's coastal and forest areas, as well as in residential orchards, vineyards and gardens. It also grows along the northwestern, North American Pacific coast, through British Columbia, all the way to Alaska. The scientific name for this plant is Claytonia Perfoliata. The plant became known as Miner's Lettuce when the Gold Rush miners started eating it as a way to prevent or cure scurvy, a common disease in the 18th and 19th centuries, caused by a deficiency of vitamin C. The plant was also used as a dietary supplement by Native American Indians. According to Hank Shaw, author and food blogger, most of the edible weeds consumed in the United States are of European origin, such as dandelion, plantain, thistles, chickweed, purslane, garlic mustard and Shepherd's purse. The native North American weed which came to be known as Miner's lettuce made such an impact that early European explorers brought the seeds back to Europe, where it became an important source of vitamin C.
Miner's lettuce grows best in cool temperatures so you should plant in early February. Create rows 12 inches apart. Place several seeds in each spot, separating them by ½ inch and cover with ¼ inch of soil. (You can plant up to 300 seeds per foot. )For best results, use a quality potting soil. Water regularly. This plant thrives in a moist, humid climate, so be sure to not let the soil dry out, while taking care to not over water. Seeds should germinate in about two weeks. Some thinning may be required if there are too many plants close together. Ideally, you should have plants spaced about 4 to 6 inches apart. You should have your first harvest in about a month and a half. Crop the stems about halfway down. Do not cut the plant until you are ready to eat or serve it. If you live in the Pacific Northwest, you may be able to harvest wild growing Miner's lettuce. The best time to gather the plant is between February and May. Look for Miner's lettuce growing wild around trees, rocks and shrubs. The plant thrives in shady, moist places, so look for it near streams, springs, ponds or anywhere near a water source. Take care when gathering Miner's lettuce because it often grows near poison oak. Use scissors to snip the stems. The cups, leaves, stems and flowers are all edible. Miner's lettuce is best when eaten fresh, right after you gather it. It has a mild, delicate flavor and makes a delicious addition to salad or sandwiches. It can also be boiled, giving the plant a similar taste and texture to spinach. However, more of the nutritional value is retained when consuming the plant raw. This wild, edible plant has become a popular delicacy in the Pacific Northwest. Some restaurants in this area hire professional foragers to find and gather Miner's lettuce, which is served in salads and as a garnish. The next time you visit Northern California, take a few moments to observe the natural flora around you. If you get lucky, you might find an afternoon snack peeking up between some rocks or nestled at the base of a tree.